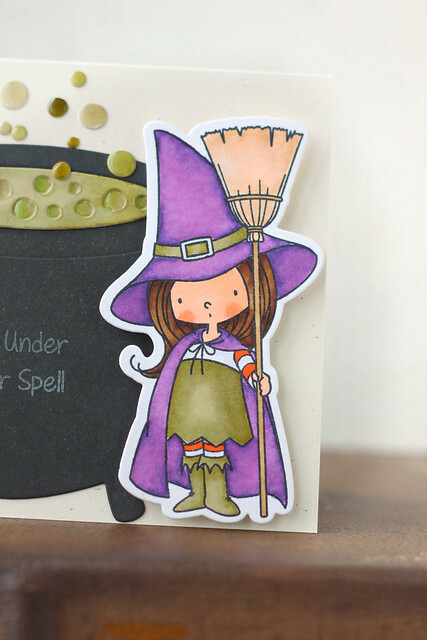 I'm showing off a cute witch today: witch way is the candy and the matching die-namics, as well as the witch's cauldron die-namics and a little strip of the you've got mail stamp set. Everything will be available for purchase in the MFT store on August 12th. When I saw that adorable witch, I knew I wanted to play around with her. She looks like she just cooked up some trouble, with her tiny mouth drawn like that! She naturally paired with the huge cauldron, and I used glossy accents on the potion bubbles. It looks perfectly slimy, hee hee. To give the card a bit of balance, I reached for the airmail strip from you've got mail and stamped it in a bright orange. I hope you like it! Visit the MFT blog for more of what's new and for more inspiration today! Love how you paired the darling girl image with the cauldron. 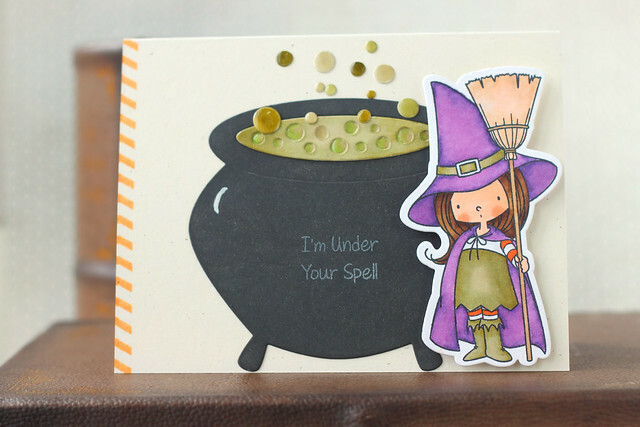 Love your card and I'm grateful that you paired the little witch with the cauldron. I had no idea the cauldron was so big! Your witch is absolutely adorable! Oh my!!! That is soooo stinking cute!! Really darling, Elena. Nice to see you again today! Super cute card! I love how you used glossy accents on the potion bubbles, I thought they were enamel dots lol! Congrats on being a guest designer at MFTs! The bubbles are so realistic. Cute card!! So cute! the bubbles in the cauldron are perfect and I love that little girl! Very cute image...love the Halloween colours. OMG, this is super cute! Love your bubbles!! Adorable card! !